U.S. President Donald Trump waves as he arrives at Akron-Canton airport in Canton, Ohio, March 20, 2019. On his way to Ohio Wednesday, Trump told reporters outside the White House that the public should have access to the Mueller report. Late last year, Trump told Reuters that he was not concerned about impeachment. “I think that the people would revolt if that happened,” he said. Trump’s Republican allies in Congress are also poised to leap to his defense. Some Democrats want to keep pushing, including former Hillary Clinton senior adviser Philippe Reines. Reines wrote recently in the New York Times that Democrats would be doing a “civic duty” to pursue impeachment. Recent polls show most voters do not favor impeachment at this time. A Quinnipiac University poll earlier this month found that 59 percent of those surveyed do not think House Democrats should initiate impeachment proceedings against the president, while 35 percent support the idea. 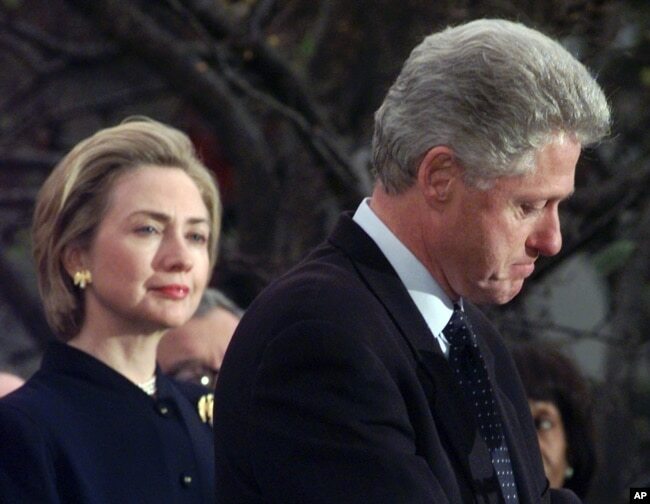 Then-first lady Hillary Clinton watches her husband, President Bill Clinton, pause as he thanks those Democratic members of the House of Representatives who voted against his impeachment, Dec. 19, 1998. Historically, impeachment has been a rare event. Clinton was only the second president impeached by the House. Andrew Johnson was the first back in 1868. Johnson avoided removal by a single vote in the Senate. Presidential impeachments have been rare and that is by design, according to University of Virginia expert Larry Sabato. Republicans paid a price for the Clinton impeachment, losing five House seats in the 1998 midterm elections. And Sabato said that lesson could have resonance for Democrats today as they mull impeaching Trump. “Given the fact that the Republicans took a wounded Bill Clinton and made him almost invulnerable for the rest of his term, it should serve as a warning to Democrats,” he said. Experts also note that the damage to Republicans from the Clinton impeachment was not long-lasting. George W. Bush narrowly beat Al Gore in the 2000 presidential election, and the political fallout from Clinton’s scandal may have cost Gore the presidency. 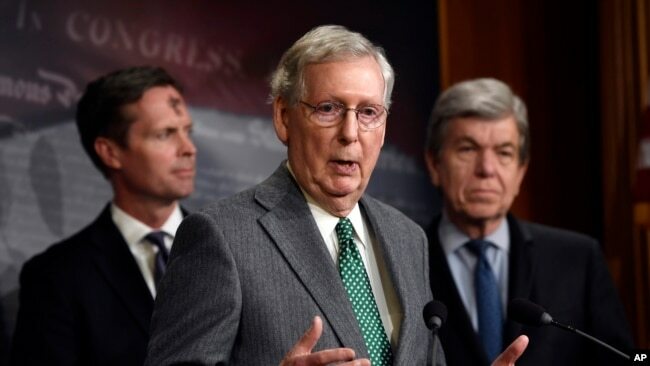 Senate Majority Leader Mitch McConnell of Ky., center, speaks during a news conference on Capitol Hill in Washington, March 6, 2019. The biggest obstacle facing any impeachment effort of Trump is the Republican-controlled Senate. Democrats would have to bring over at least 20 Republican senators in any impeachment trial in order to get a conviction and remove the president from office. A vote to impeach a president only requires a majority vote in the House, now controlled by Democrats. But in a Senate trial, it would take 67 of 100 senators to vote for conviction in order to remove the president from office, and Democrats concede that is not a possibility at the moment. President Richard M. Nixon and his wife, Pat Nixon, stand together in the East Room of the White House in Washington, Aug. 9, 1974. 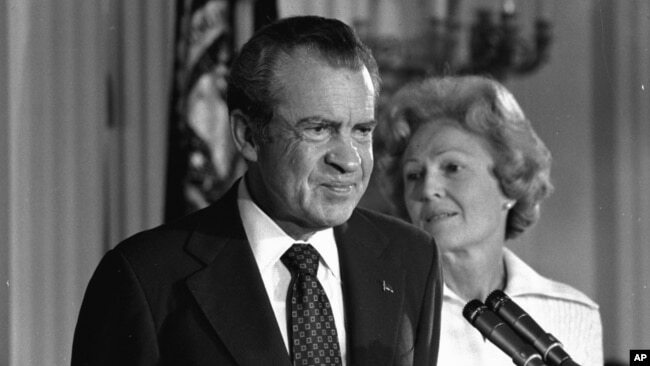 President Richard Nixon was not impeached over the Watergate scandal in 1974, but the process was well underway. The House began impeachment proceedings through the House Judiciary Committee and was preparing to move Articles of Impeachment to the House floor when Nixon decided to resign. Several Republican senators including Barry Goldwater went to the White House and made it clear to Nixon that he had lost Republican support and would not survive an impeachment trial in the Senate. But other experts caution that it would have to be something quite serious for Republicans to even consider abandoning the president. Given the lack of bipartisan support for impeachment at the moment, it does seem more likely that Trump will face the voters again in 2020 before he has to contend with a Democratic-led impeachment inquiry in the House.